- Grind cinnamon, green cardamom, fennel seed, star anise, and allspice (you may choose to use pre-ground ingredients). - Mix together ground spices, orange zest, and chopped garlic until a paste is formed. Rub over duckling legs and let marinade for 24 hours. - Mix salt and sugar together. On a half sheet pan, sprinkle a dusting of the sugar and salt mixture. - Place legs over mixture. Dump remaining salt/sugar mixture on top of the legs. Let marinade for another 15-18 hours. - Remove salt and sugar from duck legs by quickly rinsing under running water. - Heat chicken stock with split heads of garlic, thyme, and peppercorns. Submerge duck legs in stock. Bring to a simmer. - Cook until meat is fork tender. Remove and cool. - To serve, brown legs in a pan. Remove legs and set aside. - In same pan, sauté endive leaves and remove. Then sauté gai choy and remove. Sauté mushrooms and remove. Then sweat shallots and garlic confit. De-glaze with sherry vinegar. Add duck jus. Simmer and add back to sauteed endive, gai choy and mushrooms. Season with salt and pepper. 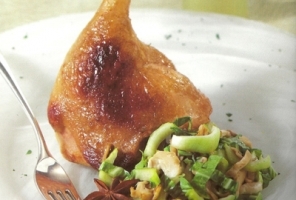 - Place legs and garnishes on a plate. Top with raw endive chiffonade and a sprinkling of fine herbs.